If someone had told me this time last month that the best rabbit I will have ever eaten would be served to me at a restaurant in Balaton, I would’ve laughed a hearty laugh indeed. And if the person followed up with a whisper, “And it will be locally sourced,” I would’ve furrowed my brow angrily and asked the person to leave the room, please. Balaton Lake is a wonderful place to spend the summertime with family and friends. But it certainly was not known for its food scene the last time I checked (or rather, the last last time I checked). Fried dough or marrow toast hits the spot after a sunny day by the water, and good ice cream can be found pretty much everywhere. But the more substantial stuff my family usually cooked at home, often in a cast iron cauldron mounted over the fire pit in the front yard. Menus at Balaton restaurants all tend to be the same and they never rotate, not annually and definitely not seasonally. The quality of the ingredients is usually quite poor and very little is prepared fresh, in house. The most popular item, called “Balatoni hekk,” is actually hake (a marine fish) imported cheap and frozen from the southern Atlantic, deep fried in a heavy batter and served with french fries. It’s been overcooked every time I’ve had it. Not to mention, something about eating saltwater fish on the banks of the largest lake in Central Europe weirds me out, especially when it’s renamed hekk “from Balaton” to make it seem local. 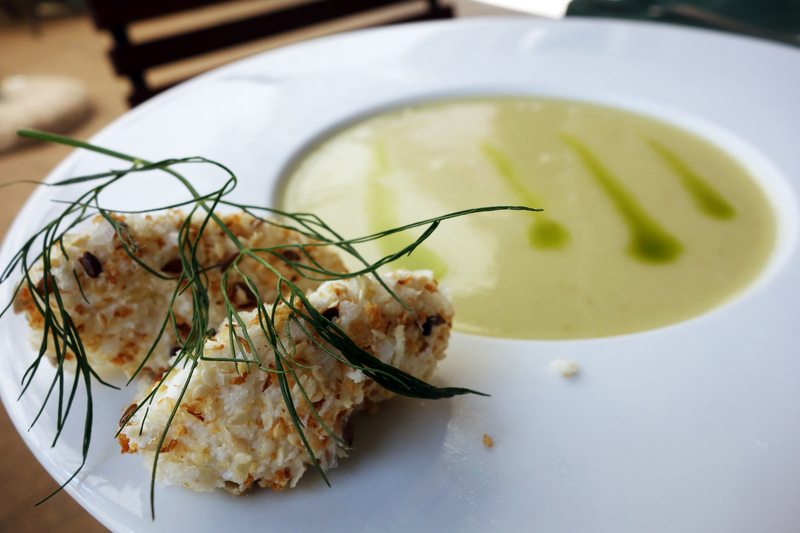 Kistücsök (Little Cricket) is far from the typical Balaton eatery. Having surpassed the status of top restaurant in the region, it has even been referred to as one of the best in the country. On a recent trip to Balatonszemes I met with owner Csapody Balázs, who explained his concept. Csapody is a man who’s traveled the world and kept his eyes open in so doing. Dissatisfied with the low standards in service and sourcing set by restaurants around Lake Balaton, he made it his goal to change the dining culture there. He had enough confidence in the region and in his own vision to open a restaurant in a vacation town and to maintain it open throughout the year. It was a gamble that turned out quite well in the end; the restaurant now has a solid base of regulars and people come from all parts of the country (including Budapest) to eat at Kistücsök. 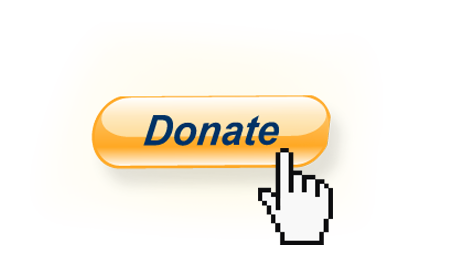 One of Csapody’s key missions is to source locally every product that enters his kitchen. Working closely with Csapody and the entire BOH team, Executive Chef Jahni László has put together a seasonal menu that reflects the bounty of Hungary and particularly the Balaton region. 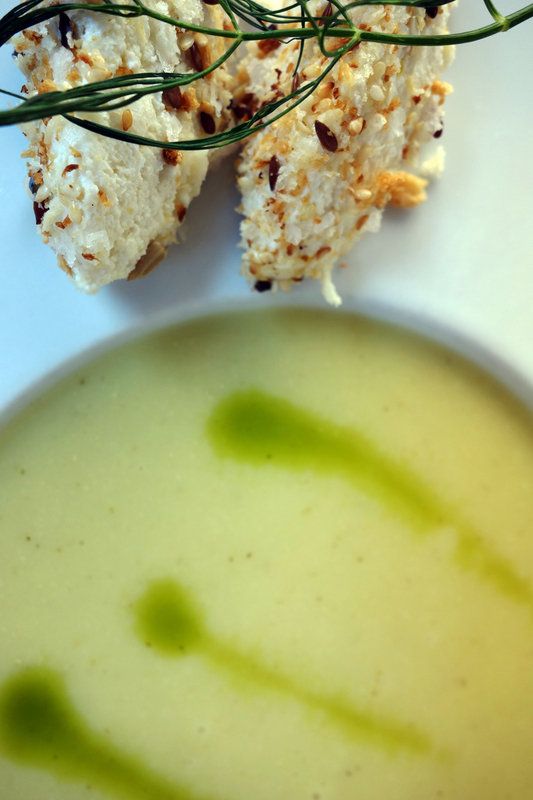 Fronting the a la carte is a set menu of 4 courses which best reflect the season’s offerings. An impressive wine cave boasts a fully Hungarian collection and many of the 300+ wines come from the Badacsony region in West Balaton. In fact, the wine cave regularly hosts wine tastings where guests can learn about Balaton wines specifically, Balatonboglár wines even more specifically. It’s Csapody’s dream to one day source everything from within a 75 km radius. It’s a goal to which the restaurant is already very close. In addition to being active BOH and able to recite the names of every producer he works with at the drop of a dime, Csapody is also very much present in the dining room and outdoor patio, where he greets guests with a friendly smile and welcomes them to his restaurant. Throughout service he keeps a keen eye on his FOH staff and makes sure to meet any special needs his guests may have. But he does so in a way that is never overbearing. His office is actually at the very edge of the restaurant and has glass windows through which he can see the entire terrace. And visitors can see him, too. After a brief interview Csapody invited me to try the seasonal prix fixe, taking a step back to allow his food speak for itself. After a cool glass of housemade elderberry soda I dove right in to what would be a very memorable meal. The amuse bouche was, quite appropriately, what is best in Hungary towards the end of the summer. When it’s the season for watermelon, everybody knows it. Here it came in a single, juicy cube that had marinated in its own liquid with a touch of fresh thyme added for herbal intrigue. The watermelon was at the perfect stage of ripeness. It was firm and crisp, saturated with its own sweet juice, which was curbed slightly by the fragrant, savory thyme. 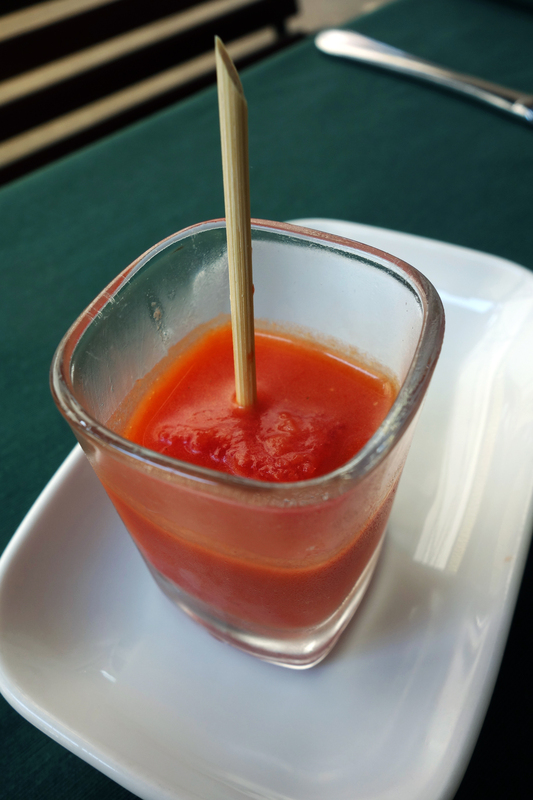 Glowing with a healthy red hue, this simple little dish represents everything I love about Hungary in the summer. And it was just the start. 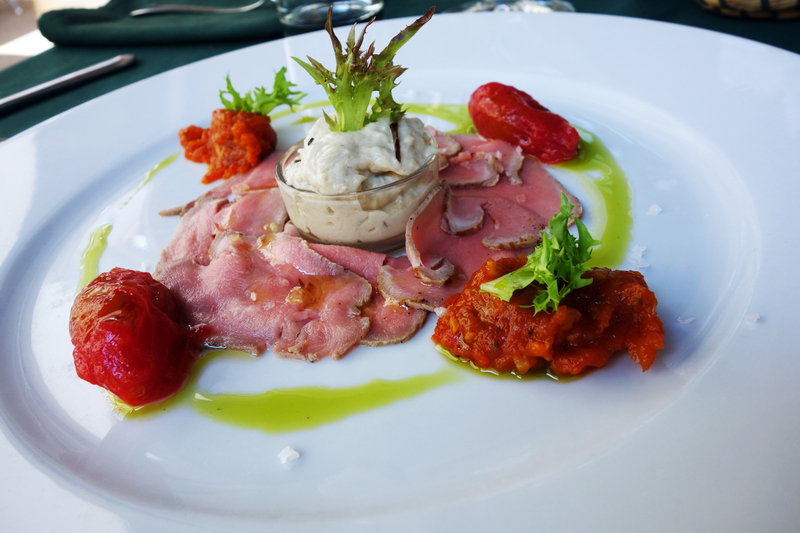 Kistücsök’s signature “Vitello carpato a Balatonnal” is a clever play on a classic Piedmontese dish called “vitello tonnato.” The Italian original is a cold antipasto of thinly sliced veal drenched in a mayonnaise made with oil, egg yolk and pureed white tuna. Here the tuna has been proudly replaced with a local fish, freshwater carp from the Balaton. The fatty belly of carp is whipped up into a light and fluffy spread served in a small glass ramekin for the guest to add as much or as little of as desired. It’s not smoked (or, if so, only very lightly) but has a pleasant fishy flavor which is cleaner than what I had expected. Around the buttery belly cream are angel soft slices of veal which, when chewed in a bundle, bleed forth its juices. The delicate taste is brought to the forefront by the flakes of Maldon sprinkled over the top. Veal and carp go beautifully together, neither overpowering the other in neither taste nor texture. Also present on the plate are a confit tomato and a slightly sweet tomato jam flavored with bay leaf. When I challenge Balázs with the names of the tomatoes he responds without a moment of hesitation, identifying also the different farmers from whom he gets them. Local, local, local. And it shows. Both are absolutely bursting with flavor, the confit ökörszív a bit more acidic than the herby, round jam. It’s a busy plate, but busy with little treasures that show off the talent of Chef Jahni. And the different flavors harmonize in the end. On a hot summer day a cold soup is certainly welcome. A gorgeous bowl of food arrived in front of me next. In the bowl was a rich, creamy soup of squash seasoned with fresh dill. The texture was velvety smooth, dense but still uniquely light on the palate. Leafy green drizzles of olive oil added a nutty, ripe flavor to round out the vegetal sweetness of the squash. On the wide brim of the dish sat two little quenelles of fresh orda cheese, rolled into a coat of toasted bread crumbs and Maldon flakes. Orda is a cheese made from heating the whey of cow’s milk similarly to how it is done when making ricotta. It’s wonderfully smooth with very fine grains and it tastes clean like fresh cream and nothing more. To the blank canvas of the orda was added the subtle nuttiness of toast crumbs and sesame seeds. The dumpling reminded me of two little creatures leaning against one another, shaking with anticipation before their dive into the Balaton (the soup in this case). Or was I just fantasizing about doing the same? And then came the bunny-rabbit, which would be the best I’ve ever had. (I was not exaggerating.) It was the saddle of the creature, incredibly tender and moist bits of meat that made my heart tremble as I chewed them. 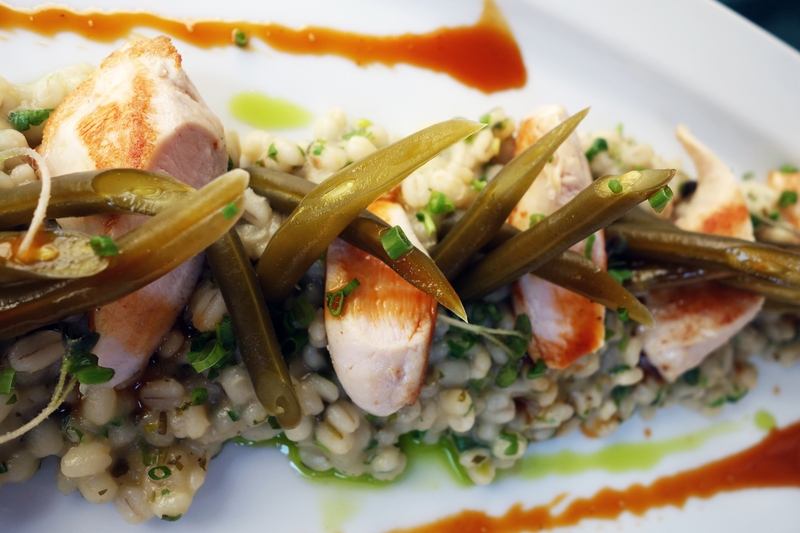 This was one of those dishes that would make me stare seriously at my eating companion while nodding my head “yes.” The subtle little morsels were served on a bed of creamy barley, chewy and starchy with the flavor of clean earth and hay lingering long after each bite. The porridge of barley was flavored with plenty of coriander and lemon to keep things light for the summer and to balance the natural musk that the grain brought to the dish. 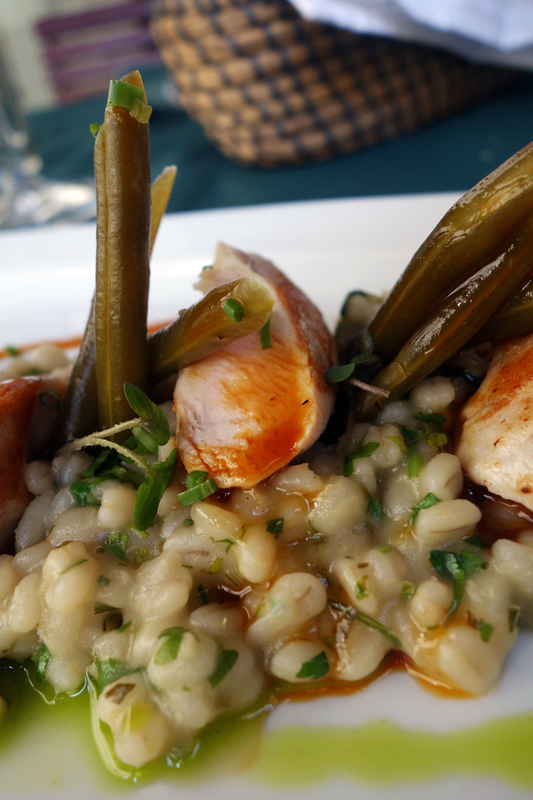 The flavors of the barley also harmonized fantastically with the spikes of kovászolt nyári bab served with it. “Kovászolt” refers to the method of fermenting certain veggies by placing them in a jar with a brine of warm salted water, some dill, garlic and a piece of toasted bread, and leaving the jar in the sun for three days. The yeast from the bread (a.k.a. the kovász) helps ferment the veg and imparts a uniquely musky flavor to it. According to Csapody, this technique was used in the old days to pickle all sorts of stuff, but now it’s mostly for cucumbers. In this dish he brings back this old-school technique by applying it to string beans instead. The result is truly wonderful. The subtle yeasty note of the pickled beans goes perfectly with the earthy barley and these flavors are delicate enough to not overpower the natural sweetness of the bunny flesh. Still another layer is imparted by the addition of a thick syrup made by reducing the backbone off which the meat was picked. It’s an unctuous demi-glace packed with the essence of rabbit, savory and dense with flavor though not syrupy in the least. This dish was the focal point of the menu and I had high expectations for it but I never expected it to be so well-thought-out and satisfying. It was truly a memorable experience. The meal ended the same way it began, with a showcase of a ripe fruit that would be a shame not to showcase during Hungary’s summer months. This time, peaches. Perfectly ripe, sweet, tender peaches were grilled to caramelization and served with a crumble of shortbread baked in house, along with a dollop of creamed cheese seasoned with vanilla and a touch of lime. The shortbread was warm and flaky, sizzling and nutty on the tongue. The crunchy texture contrasted beautifully with the soft yet firm peaches, which were hydrated by just enough syrup poured over the top. The cheese brought a coolness to the warm ingredients and its delicate acidity woke up the sleepy flavors of the shortbread and grilled peaches. I’m rarely blown away by desserts; this was a rare exception. Each component masterfully prepared but altogether simple to allow the star ingredient to shine through. Another spotlight on a gorgeous local ingredient. I squinted hard to find something to not like about Kistücsök. I’m cautious when it comes to restaurants that have achieved high status in Hungary, especially those that welcome “foreign” food writers with so much enthusiasm. But there was nothing to be suspicious about and nothing for them to hide. Kistücsök is doing things right. They bake their own bread, roll their own pasta, make their own cheese. Dessert often appears on the menu as just the main ingredient, prepared “however we feel” each day. The ingredients are sourced from farmers and breeders with whom the owner keeps close contact. And if the product of one isn’t up to standard one season, he goes to another or refuses to put the ingredient on the menu altogether. The attention to detail shows, as does the Csapody’s open-mindedness towards new ideas gathered from his travels abroad. His menu blends perfectly the old-school practices sacred to traditional Hungarian cuisine with the style and presentation typical of Mediterranean countries, all with ingredients plucked directly off the country’s abundant terroir. 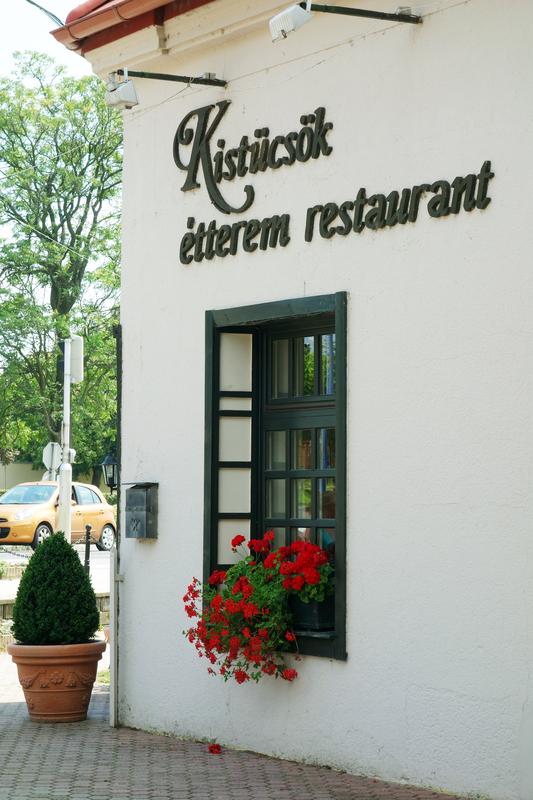 Kistücsök is the type of restaurant that puts Hungary on the map culinary. It’s the type I hope to see more of soon. August 7, 2014 in HUNGARY.